1. 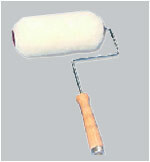 A ½ inch spade handle Drill (0-700 rpm) with a Mixing Paddle is ideal for refreshing / mixing paint before application. B. For multi-story walls, use a short handle and stroke like you would with a paint brush. Mineral paint brushes are thicker and hold more paint than standard brushes, so they speed the work of getting lime paint onto the wall. They are squat and thick, designed to withstand vigorous brushing when paint is worked into the surface in a crosshatch pattern. The round, pointed brush is useful for getting into corners and alongside masking tape. These brushes have natural bristle, a must when working with lime paint (Lime dissolves bristles of cheaper quality). Masonry Brushes may be used for applying Silicate Paint, in particular, the second coat or wash coat. Paint pads can be used to apply Silicate Paint, especially handy for interior walls. An overlapping circular motion gives a nice smooth variation of tone, or up and down application gives a wood grain texture. Silicate Paint can be sprayed for exterior walls. 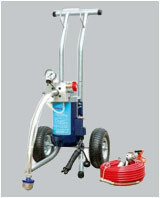 A variety of sprayers may be used giving the quickest and smoothest application.